Love making French fries at home, but hate having to rely on frozen and factory produced supermarket fries? Or maybe you’re just fed up of fighting with endless cuts through hard potatoes just to try and be a bit healthier and make your own? We know how you feel. Thankfully, these French fry cutters make preparing fresh homemade fries almost effortless, and can even turn it into a fun activity if you’ve got any kids around that just love to help out with everything. Heavy duty cutters – often quite bulky and built fully out of metal. These are what restaurants have been using for decades, and are ideal if you’ve often got plenty of mouths to feed, and just want to get some perfect French fries prepared, no questions asked. Simple, lightweight cutters – often made with hard plastic attached to a metal cutter pad. While not as efficient as their heavy duty big brothers, these lightweight cutters are easy to use and ideal for anyone who is just looking to occasionally prepare fries for a handful of people. Handle push cutters – more of a tool than a cutter, these are small and simple handles fixed to cutting blades, that you manually push down. Easy to use and store, these are great if you just want to make life a bit easier, but not such a big fan of fries that you want a standalone cutter. While there are plenty of variants for each of the three types of cutter, there’s a lot of bad versions out there – which can make it hard to find the good ones. So to avoid confusion, we’ve kept things simple. Instead of ranking the ‘Top 10’ – which would inevitably include a few bad apples – we’ve simply recommended the best of the best for each cutter type. Have a think about the amount of use in an average week you’ll want to get out of your cutter – then check out the top cutter for the type that will match your needs the most. 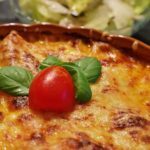 Need a great recipe? We love this one. 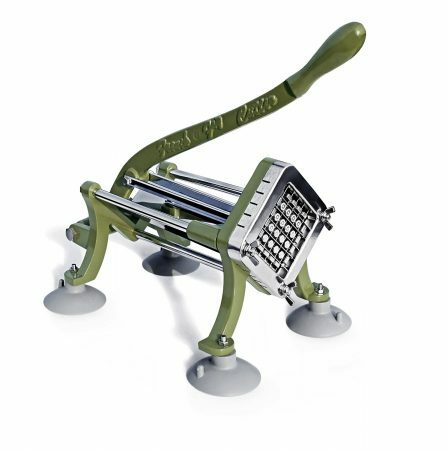 If we were only to recommend one french fry cutter to you – it would be the Cucina French Fry Potato Cutter. As far as simple and lightweight plastic models go, this one is the clear best – without having an inflated price tag to match. It’s got a curved base and push pad to help grab each potato, which really helps give you more leverage and an easier cut. The suction pad on the base is nice and strong, and the two types of cutting blades that are included means you can satisfy both small fry and big fry lovers. It’s our definite top pick for a quality cutter that’s also fantastic value for money. 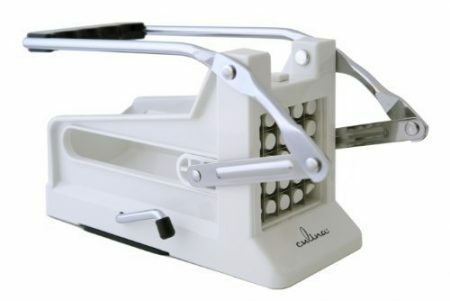 Our top recommendation – Cucina’s French Fry Potato Cutter. Forget modern plastics – this is all well-built, sturdy, and strong metal. The NewStar42313 fry cutter is a traditional version that’s managed to avoid suffering from the craze of using cheap plastics to cut costs for the manufacturer. It’s heavy, robust, and reliable. Coming with some very strong suction cups, it’s a cinch to get this cutter firmly attached to your countertop (or even wall) to help you get maximum force onto the lever. The cutter blades are fully interchangeable, however you do need to pick them up separately (links to both the 1/2” and 3/8” models and separate blades below). And thanks to the heavy metal parts, this cutter can handle sweet potatoes – but they do need a fair bit of force to cut cleanly. If you don’t have a strongman arm available to you, give them a quick 30 second shot in the microwave to soften them up. Strong suction feet (easy to wall mount) Suction cups hard to remove once done! When it comes to French fry cutters that will get through any type of potato – this is one of the best. Without having a commercial-sized price tag, the quality build of this cutter speaks to itself – harkening back to the old reliable tools that your grandparents used for decades. If you’re serious about French fries, you’ll seriously love this French fry cutter. Modern efficiency personified in a French Fry Cutter. Who would’ve thought. 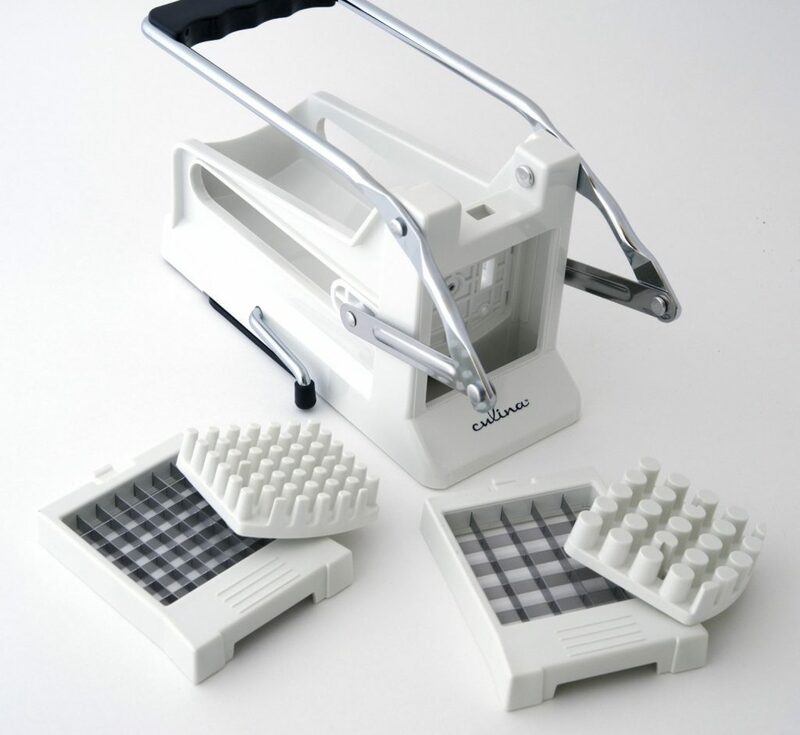 While it may look like a generic white plastic appliance, this Cucina French Fry Cutter is actually a fantastic piece of equipment. The handle positioning offers great leverage for potato cutting power, and the suction base keeps the cutter held securely to your counter. Both the base of the potato tray and the pushing pad have been curved to grip the potato and allow for better transfer of force. The cutter also comes equipped with two easily interchangeable cutting blades – for both 1/2 inch and 3/8 inch fries. A testament to the build quality of this cutter is that it’s quite capable of cutting down sweet potatoes – and can even send normal potatoes flying forward a bit of a distance if you’re a bit too strong on the handle! 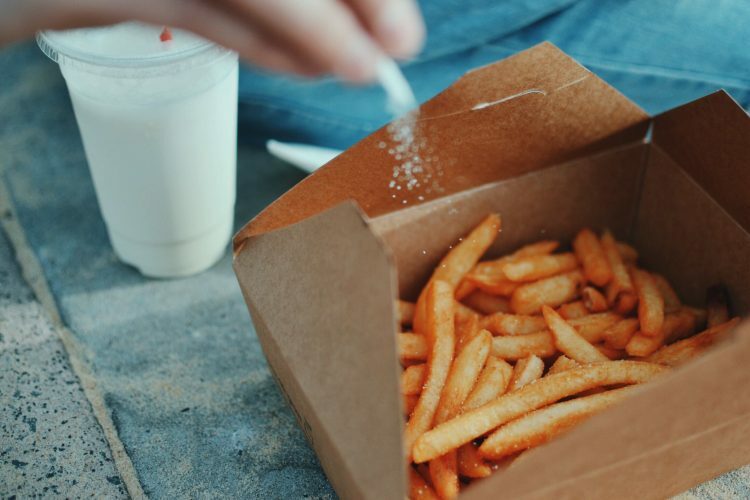 The only small issue we have is that it’s quite low down to the counter, which means you can’t simply catch the fries by putting a plate infront of it. However, this is easily solved by tucking a piece of kitchen roll under the front end. This French fry cutter really surprised us. It’s efficient, easy to use, easy to clean, and priced very competitively compared to the other cutters that can cut this well. It’s one of those appliances which manages a great balance between price and power – which makes it our top overall recommendation for French Fry Cutters. One small tool to solve multiple fresh food problems. This Gourmia Handle Push Cutter is a great solution to cutting French fries. While it’s not a traditional French fry cutter with a handle for leverage, it’s firm exterior and very sharp blades mean that you can use it to slice through spuds in a cinch. It is a bit more of an arm workout than working the handle of a typical French fry cutter, this little tool has the great advantage of being easy to clean and easy to store. 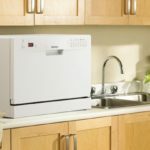 You won’t need to go through the effort of finding somewhere to store it when you’re not going to be using it – it’ll fit right into a cutlery drawer. 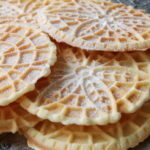 It’s also fantastic for making fruit much easier to prepare. 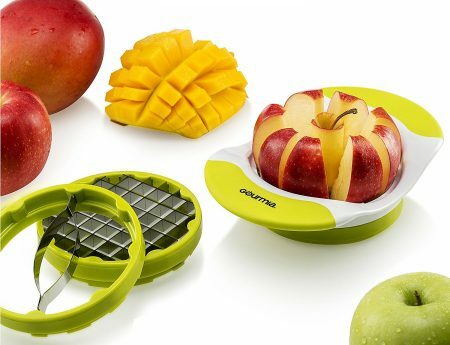 If you or your family are trying to include more fruit and veg into your diet, you won’t believe how much easier it is when you can use the other two included blades to core and slice an apple, pear, or mango in seconds. Just don’t try it on an orange; things get… messy. Multipurpose - use with any small fruits / vegetables Needs a bit of muscle at times! While this isn’t a traditional French fry cutter and won’t be the quickest solution if you’re looking to cut through dozens of spuds in an evening, this handy little tool is a fantastically simple but entirely useful addition to your kitchen arsenal. Not only does it make cutting a family-sized portion of French fries easy, it also makes preparing fruits and vegetables effortless. We hope that this post has helped you in your search for making perfect homemade French fries. If none of our top 3 have caught your eye – check out the other models available on Amazon here. But as we mentioned above, it’s important to keep in mind that almost all cutters on the market are based on these three types, and out of them all – these are the best three that we’ve found. So don’t spend too long worrying about finding that perfect model! With that said, we hope you’ve enjoyed this review – be sure to check out our other reviews of the best products to upgrade your home and make life easier and more relaxed. Until next time, may your fries be crisp and your potatoes golden!